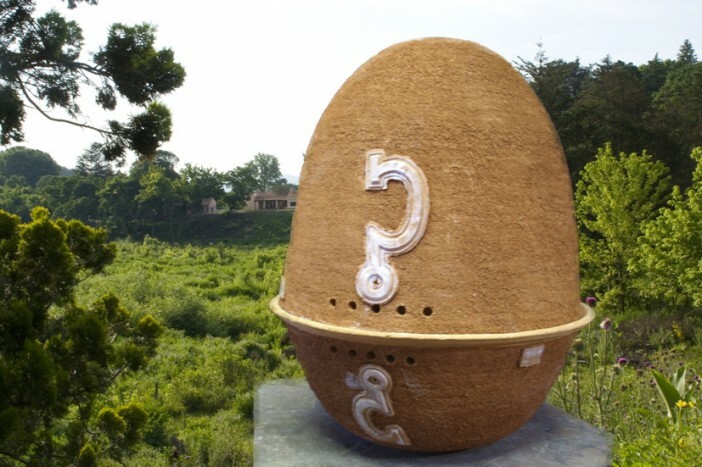 Specially designed to overcome the “varroa destructor” infestation of bees : The egg shaped beehive having no angle, allows a fluid ventilation by the beeworkers to impeach any varroa and parasite to enter their home. Terracotta was chosen because all the wild bees in Pampa Grande are making their home with it. It is an excellent material to compensate seasonal and day temperature change : it is cool in hot summer and warm in winter; a fine way to ease the life of the bees in these times of climate change. In summer the hive is placed upside down with the hive cap up. It has a hole on top to enable more caps on top and produce more honey, if possible in the good years. The bottom, the big habitat which is the bees’ home, is never harvested in order to provide sufficient stapple food for the bees during the whole winter. The hole on the cap allows also to separate naturally the honey from the wax : you harvest the honey by displaying it at a low heat from the sun and recollect it in your pot through the hole, making it extremely easy to manipulate even by a neophite. This beehive is inspired from the ancient Egyptian clay-beehives and by the theories of the French poet and artist Maurice Chaudière.